Simply choose your items and leave the rest to us! We can be contacted by phone or email, or you can make an appointment to meet us in Javea. When browsing the IKEA site you can add items to your basket to create an order. You can then email us this list directly from the website - it will have all the reference numbers and information we need to create your personal quotation. Not all IKEA stores have the exact same products or product lines. If any of the items you have chosen are not available at the IKEA Murcia or IKEA Valencia stores we will let you know. We'll always try to provide you with alternatives to choose from when we provide our personal quotation to you - before we shop for you. 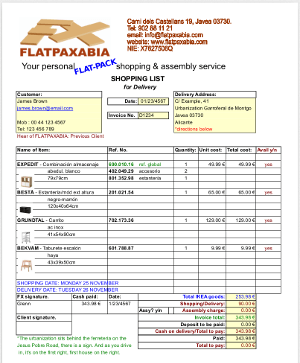 At FLATPAXABIA we aim to make your order process as easy as possible. Simply let us know what items you’d like and we’ll do the rest – from checking availability at the IKEA stores in Murcia and Valencia to making sure you have all the components you might not know you need – for example, IKEA beds sold in Spain may require the bed slats ordered separately! We know all the particulars and try to make sure our clients get exactly what they want. Once we have your order, we’ll create your personalised shopping list and include any details or notes as needed. You can then look it over and let us know if you want any changes. Once you’ve confirmed your order with us we’ll arrange a time and date for the services you’ve chosen. You can find our phone numbers and contact points on our contact page. If you would like assistance with placing your order with us, or have any questions regarding making an order, please get in contact with us. We’re always happy to help! We accept payments by all major Credit/Debit cards, PayPal or Bank Transfer. For large orders we will ask for a deposit to confirm your order and delivery date. For small orders full payment will be due on or before your delivery, by your choice. For our Shopping and Collection service we ask for payment when you collect your order. When choosing your items please be sure that they will fit where you want them and that there is practical access to that area. For example, be aware of narrow doorways, staircases, etc. Javea, Benitachell, Teulada, Benissa, Moraira, Calpe, Altea, Alfaz del Pi, La Nucia, Polop, Benidorm, Villajoyosa, Alicante, Oliva, Ondara, Pedreguer, Gata, Jalon, Lliber, Benidoleig, Pego, Orba. Elche, Balsicas, Torrevieja, Los Alcazares, Guardamar, Mar Menor Golf Resort, San Javier, San Pedro, Orihuela, Algorfa, Santa Pola, Sierra Golf, Torrevieja, Quesada.